In my yard I have a lot of plants that would normally be considered an indoor plant anywhere colder. There's a phrase about the tropics. If you drop a seed on the ground it will grow. Pretty much anywhere. I have Mother in Law tongue under my hedges despite my best efforts to get rid of them. Scrub palms in the margins along with Asparagus Ferns, and a lot of strange plants that I would like to know the story of. This picture has me scratching my head. On the side of my house there is a little pathway. It's a quiet little corner, tucked away from view. My bedroom window opens onto it and I see a fence. All of about 10 feet wide, there really is nothing there but the air conditioning compressor and the irrigation equipment. This little spot isn't exactly what you think of when you think of Clean Green Florida as the road maps used to call it back-in-the-day. 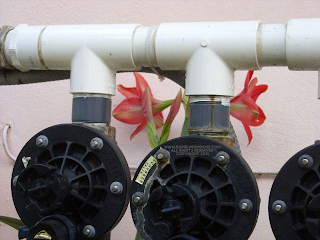 Behind the equipment, one of the previous owners planted a flower. This Amaryllis comes up every year, and blooms. If you are looking for a better description of the old saying "Bloom where you are planted" I can't think of one. There are a couple red amaryllis on the property. Each are planted in strange spots that I have to watch for when I'm out there gardening. This one is behind the irrigation valves, and you have to know it is there to see it. Another is behind a light pole and under the hedges just in a spot that the weed eater gets every time no matter how careful I am. But strangeness of place aside, their beauty never fails to please, it never fails to surprise, and it never fails to make you anticipate the day that Mother Nature takes what you give her and returns your care with great results.